Our students are working in journalism organisations all over the world. Check out our interactive feature to hear more about the CfJ's global reach. Do you want to be a journalist? 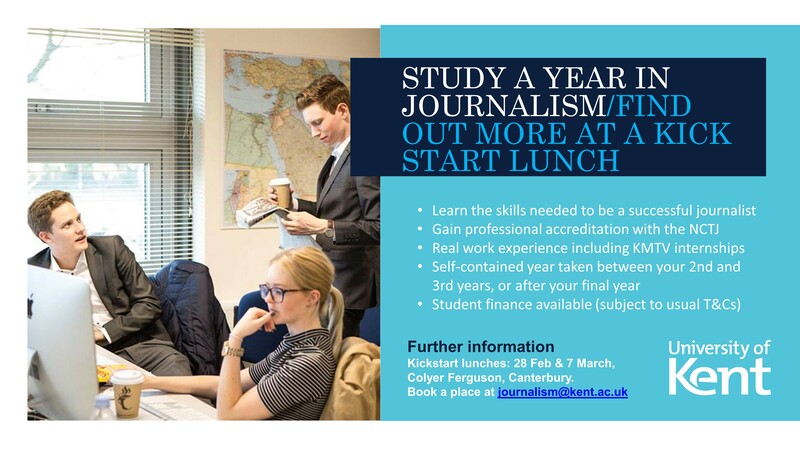 Would you like to learn the skills you need to challenge fake news and get work in a twenty first century newsroom? Now, Kent’s award-winning Centre for Journalism is pleased to offer the Year in Journalism. This freestanding, self-contained year, is open to students from other Schools in the University of Kent and can be taken after stage two or three (that is, between your second and final year, or after your final year). The programme is fully accredited by the National Council for the Tranining of Journalists. How does the Year in Journalism fit into my degree? During the year, you will work exclusively within the Centre for Journalism. You will learn in a live newsroom environment, complete with dedicated radio and television studios. Your tutors will include working reporters, former editors of national newspapers and specialist correspondents. You will study for the National Council for the Training of Journalists (NCTJ) Diploma in Journalism. This nationally recognised professional qualification is the passport to a career in journalism. You will then return to your home School and graduate (if successful) with your current degree title augmented with the words with a Year in Journalism. Iliffe Media, the UK’s fastest-growing independent publisher, has vacancies at two of its offices in the East Midlands. The Newark Advertiser is looking for an inspirational news editor to help lead the day to day operation. We are also seeking either a senior reporter or an exceptional trainee to join the team. The Stamford Mercury is also looking for a senior reporter with the potential to step up to a newsdesk role when required. Both titles are proud to be at the heart of their communities and have long histories - the Mercury is the UK’s oldest continually-published newspaper. Today sees the publication of a major study by Centre for Journalism academic staff. 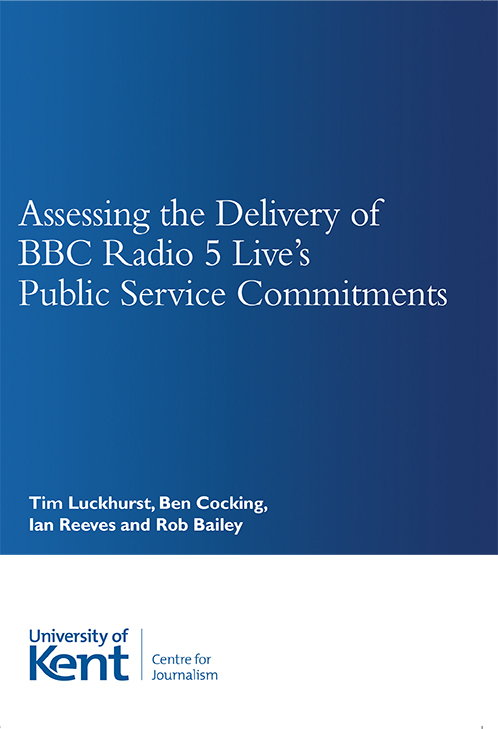 Professor Tim Luckhurst, Dr Ben Cocking, Ian Reeves and Rob Bailey are joint authors of Assessing the Delivery of BBC Radio 5 Live's Public Service Commitment, which was launched this morning at a meeting of the All Party Parliamentary Media Group at the Palace of Westminster. Members of the group chaired by Rosie Cooper MP were presented with the findings of the report, which demonstrates that 5Live is not meeting its licensing requirement that 75 per cent of its annual broadcast output should consist of news and current affairs programming. The report, published by Abramis is available to download here. You can also view it in the online reader below. The research was carried out following the award of a research grant by News UK and Ireland Ltd.